It's 1985 and I am heading to band practice. I'm trying to figure out what new songs I want to learn and questioning everything. Do I want to keep playing music, do I want to start singing more or just be a drummer and continue to sing back up for the rest of my life. At that point I really hadn't started writing music or figured out how to work my tenor voice into a set list that was filled with Merle Haggard and George Jones. I turned the radio on to try and clear my mind. The first song I heard was "Oklahoma Borderline" by Vince Gill. It was like a light shined down from heaven. When I got to practice, I asked the guys if they had heard this new song and if they knew the artist. 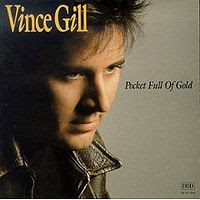 Somebody said it was a new guy named Vince Gill. Well, from that day on I started following this new artist and with each album I fell more into his music. Over the years I have sang many of his songs and have been lucky enough to see him in concert a couple times. Last night was one of those lucky nights. Not only did I get to see my hero, but I got to watch him and his friends play in the historic Ryman Auditorium. It was a magical night filled with old classic songs and new material. He featured some of his fellow songwriters and some new, young local guitar talent. He showcased his back-up singers (past and present), musicians, co writers, friends and his lovely daughter Jenny. His wife Amy Grant helped him close the show. I found myself tearing up from the first song as I listened to the music that has meant so much to me over the years. Plus the way he gave the spotlight away to so many "unknown" artists was truly inspiring. I am not sure if it was the historic theatre or the spirits of all those who have sang on that wonderful stage, but I will always remember my very first concert at the Ryman. I hope there will be many more. It was truly one of the best concerts I have ever seen. Oh, wow! I know you love Vince Gill, but I would have given anything to hear Amy Grant sing. Glad it was a wonderful evening. I saw Vince in concert in the nineties. He was great! The best part was, he just kept on playing, long after his concert was supposed to end. He was rockin' the house, at an hour when us working folk were supposed to be home in bed!